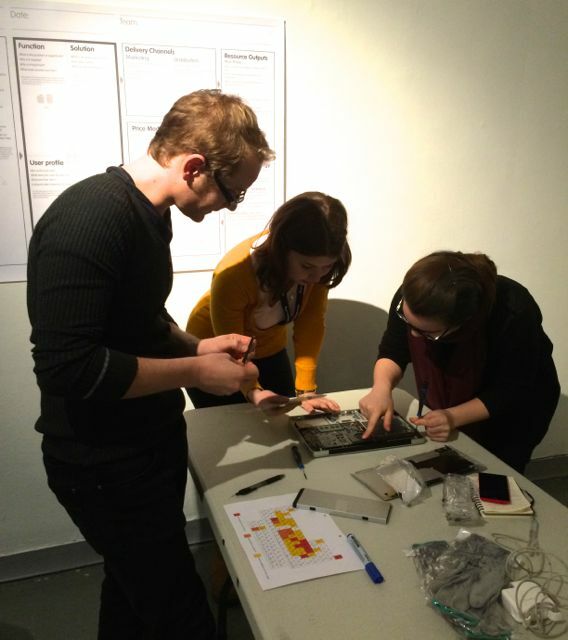 As part of the Disruptive Innovation Festival, SustainRCA, the Royal College of Art’s sustainability hub, hosted two events exploring innovation and the circular economy, practically and conceptually. The hands on workshop, Business Modelling for a Circular Economy, was the perfect complement to the evening’s panel discussion, Peering into the Next Wave of Innovation. 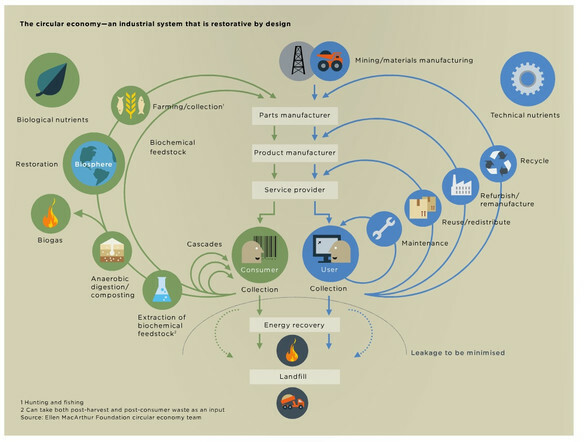 The phrase ‘circular economy’ is increasingly used by business, media and academia as a generic term for an economy that is regenerative by design. As Ken Webster, Head of Innovation at the Ellen MacArthur Foundation, described during the panel discussion, the circular economy is defined by a set of principles: two, separate cycles (pictured left): biological materials, designed to re-enter the biosphere, and technical materials, designed to circulate with minimal loss of quality; diversity provides strength and resilience; the shift towards an economy ultimately powered by renewable energy; embracing systems thinking, to reflect the real-world where systems are non-linear, feedback-rich, and interdependent; and thinking of cascades, as products are repaired, reused, remanufactured and recycled realising more value, and managing resources with less waste. The conventional, linear ‘take, make, dispose’ model has relied on large quantities of easily accessible resources and energy. We live in a diffiernt paradigm, bound by legacy systems and resource constraints. Input prices, which declined for most of the 20th century, are rising and increasingly volatile, driven by physical, and, as Mark Shayler, director of agencies, Ape, and TicketyBoo, noted, by political access. Rapid consumption patterns are losing a lot of value to landfill: around $2.7trillion of the $3.2 trillion created by the FMCG industry each year, according to Jamie Butterworth, Ellen MacArthur Foundation speaking at another DIF event. With 3 billion more middle class consumers by 2030 and a finite planet, we have to do things differently. Not just more efficiently, but more effectively. Hugo Spowers of Riversimple began the panel discussion with a complete circular economy vision for car use, from ownership to mobility, a redesign of the car, business model and corporate governance. Citing Joanna Macy, Spowers called for a simultaneous shift in method, methodology and mindset. A service dominant logic places the user at its centre, as in We All Design‘s Circular Business Board which was presented by founder Rob Maslin, as a framework for the business modelling workshop. At its heart are the ‘User Profile’, and the ‘Function’ (the problem or user need such as washing, rather than the machine), and ‘Solution’, how can we effectively, or optimally, meet the need. Against this backdrop, our first enquiry was a product ‘tear down’. We huddled round an Apple MacBook with tiny screw drivers. ‘Tear down’ suggests a heady abandonment, this was a more precise and forensic exercise. Carefully teasing the tiny screws passed battery, RAM, circuit boards, and disk-drive, (its intricacy perhaps a clue to their redundancy) until ultimately a mucky keyboard. Well-versed in product design, my colleagues were focused on the device’s limitations for repair and disassembly. Many of the environmental challenges device manufacturers face are around resource scarcity and price volatility, yet these challenges are often missing from the designer’s brief, says Shayler. The post-mortem revealed death by latte on keyboard, so our method imagined a keyboard that could be readily replaced, repaired or personalised. We sketched out a tiered service (methodology) and pricing plan. A confident and engaged user would buy their device outright, and any parts for repair or upgrade from the manufacturer or a reseller such as iFixit.or Restart Project. A second profile, a fashion-conscious, brand-lover, desiring the latest device would pay a premium to customise their keyboard, laser-etch the case, and be one of the first 1000 automatic upgrades for new releases. A third user profile, someone for whom their laptop is a service platform, predominantly for email and the internet. This user would own their device for longer, and buy a service contract without either the confidence or inclination to tinker themselves. This service-based model minimises the environmental, social and governance issues in the supply chain (using less raw materials); remodels delivery logistics to provide for the return of the physical asset; provides a tiered service plan, where the level of engagement or contract matched their service need. Barry Waddilove, Home Product Design, and team designed a network of technology clubs in charity shops for kids and young adults, making use of the ‘waste’ electronics they are given to create educational workshops and with an electronics brand as strategic partner, others kettles, hairdryers and other small electronics. In leasing or buy-back model, product recovery is key to retaining valuable material resources. The opportunities are greatest for durables. The manufacturer has every incentive to design for product disassembly and material recovery, rather than obsolescence. If Riversimple‘s car design is revolutionary, emitting only a tiny amount of water, and more than the equivalent of 200 mpg., then its business service model is even more so. 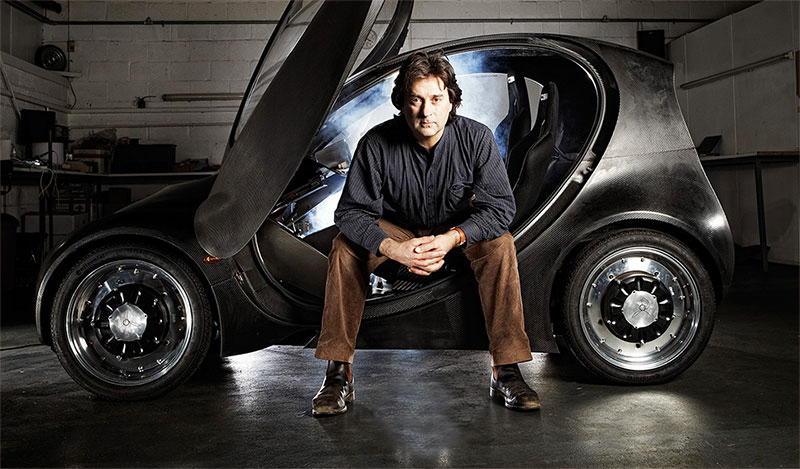 Based around a subscription, with a fixed element, and a variable element reflecting usage, Riversimple aims to maximise life-cycle profitability. The user buys an ongoing service where the product is refurbished, upgraded and replaced as required, made from higher quality materials. The potential scope is much greater than decoupling product design from raw materials. As we are five years away from losing key skills into retirement, Shayler argues, there are compelling reasons to boost innovation and engineering enterprise in the UK. There are barriers, but the mindset is shifting, with a Government report, arguing there are, “potentially billions of pounds of benefits for UK businesses in becoming more resource efficient.”, and calling for producer responsibility regulations and lower VAT on recycled goods. Spowers called for a more sustainable financial system, and also on the podium, Andy James, Founder and Managing Director of Six Degree People, described the need for greater collab oration and advisory boards to support CEOs embarking on disruptive innovation strategies. A few days later Andy’s comments were echoed by Professor Vlatka Hlupic at the launch of her new book, The Management Shift. Her research demonstrates that a collaborative culture is central to developing organisations that are more resilient, more innovative and generate better returns for all stakeholders. Innovation is joyful!